Trinity River Steelhead Typical Trinity River steelhead run 3-6 pounds, but there are plenty of big ones like this that come to the net each year. We have both wild and hatchery steelhead on the Trinity River. Drift Boat Trips Our most popular trip on the Trinity River is a drift boat trip. We typically float 3 to 10 miles in a day, fishing nymphs and egg patterns underneath indicators. This is a great way to hook multiple steelhead in a single day of fishing. Great hatches The Trinity River has excellent hatches throughout the season. Green drakes like this one hatch in March and April. Other good hatches include golden stones, PMDs, giant stoneflies, callibaetis, and march browns. Salmon on the Trinity The Trinity has runs of king and silver salmon. It is fairly common to hook salmon while fishing for steelhead. These powerful fish take long runs and are challenging to get into the net. 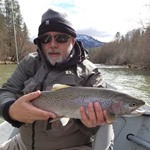 A Great Place for Beginners The Trinity River is a great place for your first steelhead trip. We typically use simply indicator nymphing techniques that beginners pick up quickly. While steelhead can be the fish of a thousand casts, that's rarely the case on the Trinity River. The Trinity River is one of the best places to hook into a steelhead in California. This is not only a beautiful place to fish, it's also one of the most productive steelhead rivers in the state. The steelies most commonly range from 4-10 lbs, but they can get even larger. They are strong fish that jump frequently when hooked. Many of the fish are wild. The Trinity has a good variety of water types. There are five different floats on the upper river, each with a slightly different character. There are runs that are perfect for indicator nymphing and riffles where swinging flies can be deadly. Full-day trips are $495 for one or two anglers. These rates include rods and reels, flies and other terminal tackle, and lunch. A shuttle is also included, which means you won't need to use your vehicle to assist with the shuttle. A note about shuttles: Shuttle service is highly reliable on the Trinity. Our guides can almost always arrange a shuttle for float trips in the Lewiston, Douglas City, and Junction City areas. Please be aware that if you are fishing outside of this area that a shuttle may not be available. Rods, Reels & Lines: The seven weight is the best all-around rod for steelheading on the Trinity River. Sixes and eights work well, too. 9ft and 9.5ft models work great. From January through March it's a good idea to have a dry fly rod also. 9ft five-weights are perfect. We primarily use floating lines. Nymph, Steelhead, or Double Taper Lines are best for versatility. Leaders, Tippet & Indicators: We usually use 1X-3X tippet on the Trinity River. We don't use tapered leaders for nymphing. 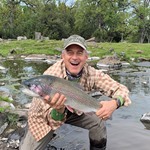 A 9' 5X leader is great for dry fly fishing on the Trinity. For indicators, we use yarn and Thingamabobbers in the 3/4 and 1" sizes. We use split shot in sizes BB and larger on the Trinity. Waders & Boots: We use chest-high breathable waders on the Trinity. Spiked wading boots are not necessary. Make sure to bring your own wading belt. The Trinity River is open year-round. Steelhead are present most of the year, but are in the river in good numbers from September through March. Meeting Time & Place: We typically meet our clients at their hotel at 7:30am. On some trips we may arrange to meet at one of the many boat launches on the river. Wading difficulty: On most trips we float the river using drift boats or rafts. We frequently get out of the boat to wade. However, we can put together a trip where no wading is necessary. The wading on the Trinity is mostly over cobble river bottoms and is not overly challenging. Multiple Fisheries in one Day: Due to the distance to other fisheries and the logistics of floating the river, we devote all day to fishing the Trinity River. Length of the Day: Most full days conclude around 5:30pm. Half days end around 1pm. Please visit our Weaverville page for hotel and restaurant recommendations and ideas about other things to see and do while you're in Weaverville!